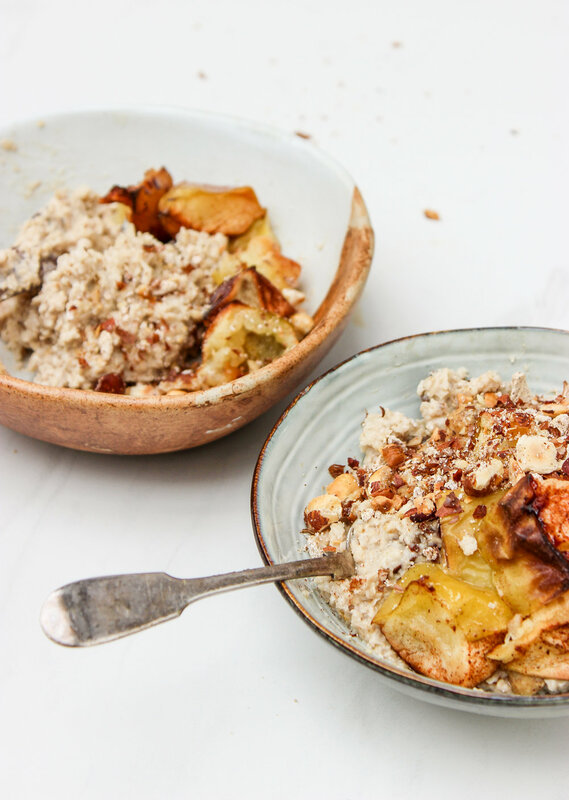 Cut the apple into large chunks and place on a baking tray. Drizzle with oil and roast for 20 minutes at 180C. Meanwhile add the water and about 10 hazelnuts to a blender or food processor. 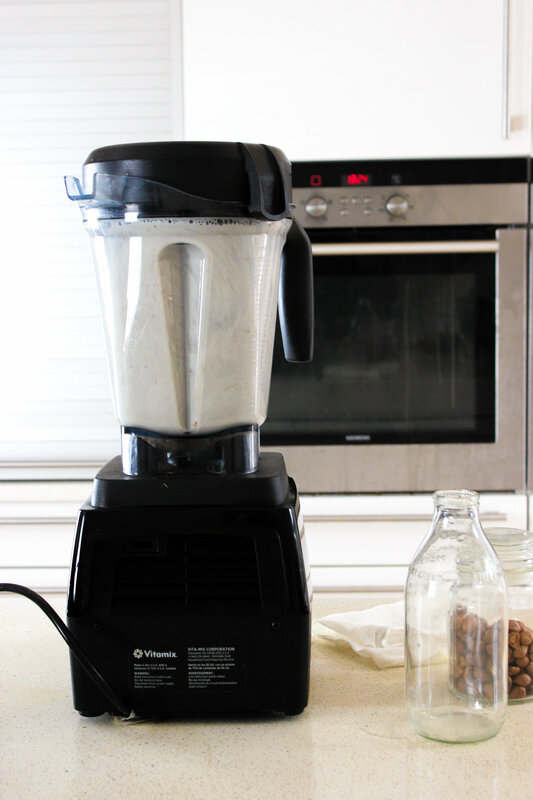 Blend until fully combined, and the water has turned a milky colour. Add the oats and hazelnut milk to a pan, along with the cinnamon and 1 tbsp nut butter. Cook for about 5 minutes, until thick. 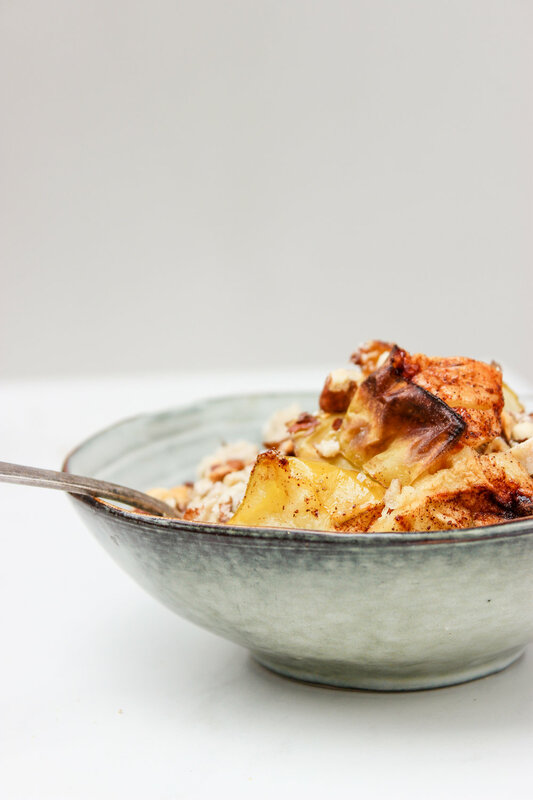 Remove, and serve with the roast apple, more nut butter and toasted hazelnuts. The hazelnuts and oats came from a bulk store, which we’re fortunate enough to have close by in East London. This would otherwise be tricky, as the supermarket options were plastic heavy. Cinnamon was tricky! We couldn’t find anywhere to buy cinnamon without packaging, so we ended up going for a plastic-free tin box (all the glass jars had plastic lids), with the intention of then ordering refills through zero waste websites. Not perfect, but a starting point. Again, oil can be tricky. We’re very lucky to have an olive oil refill station at a Deli nearby, but that’s definitely not the norm. Luckily, oil is often packaged in glass which is much easier to keep/reuse or recycle than plastic packaging, and (we think) acceptable as part of zero waste so long as you reuse it! We make our own nut butter using nuts from a bulk store (a mix of cashews, almonds and hazelnuts is our fave) but buying a glass jar of Meridian is pretty planet friendly too. Once you sit down and really think about making a meal waste free, it dawns on your how difficult it’s going to be. We figured porridge would be a really easy option, forgetting that dairy free milk always comes with packaging. 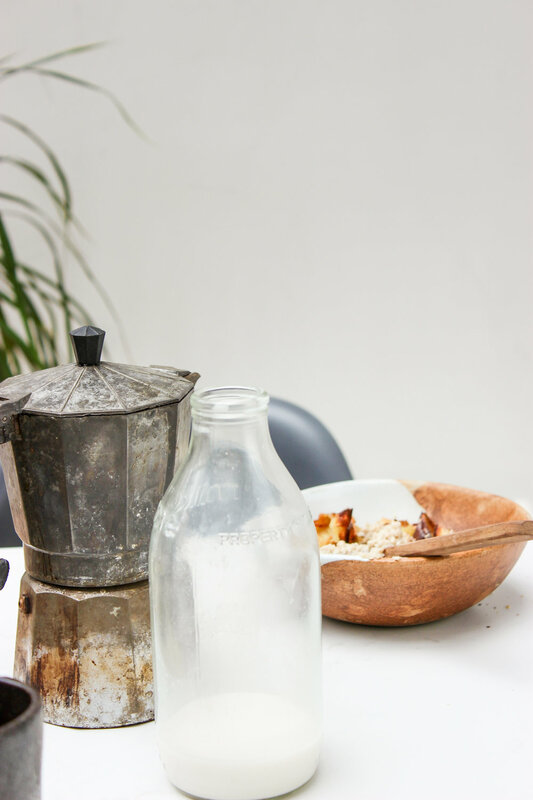 Luckily, we had a Vitamix, milk bags and more than 10 minutes of time, but zero waste is definitely about planning ahead - making your own Hazelnut milk for breakfast each morning is a luxury we definitely don’t have time for usually. 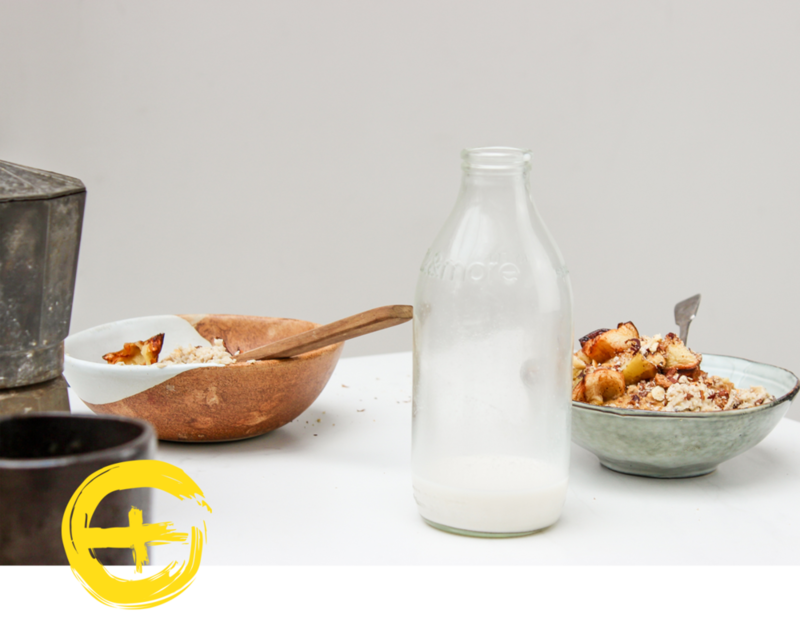 We always love coconut yoghurt on top of our porridge too, but with plastic as our enemy, it wasn’t an option. Once you get into the flow of it though, making your own milk, nut butter etc head ahead of time, I’m sure it would just become habit. Our apple had a sticker on it, we had to get our cinnamon in a reusable tin box and we guess the stickers on the cinnamon tin and olive oil bottle count as waste? Making your own milk is definitely more cost effective (and WAY more delicious), but having to buy bulk rather than grab hazelnuts at the supermarket definitely put the price up a little. Gluten free oats are notoriously more expensive, so skipping this (if you can) will bring your price down too.